What’s it about? Thirty years ago, there were no female baseball teams on a high school level in Japan. Now, the number grows every year… and Tsubasa wants Rigahama High School to be one of them. 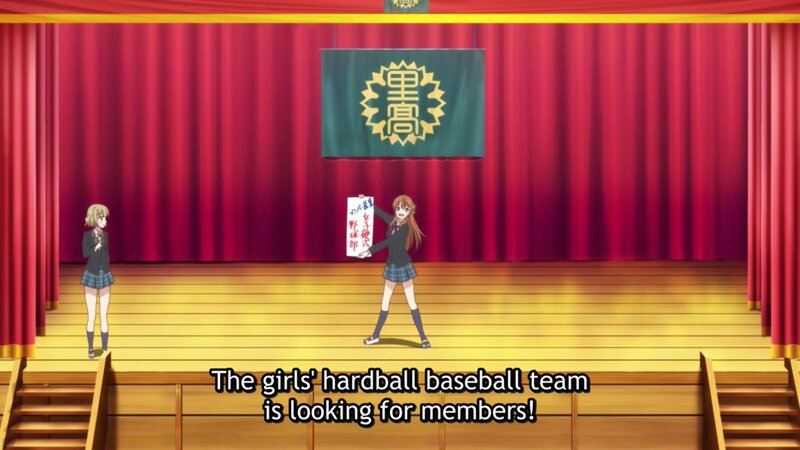 Unfortunately, the student council doesn’t share her enthusiasm and stymies her attempts at creating a team. Can she and her prospective teammates overcome the lack of institutional faith and form a team of their own? So, first things first. The cold open shows the teams playing in skirts. Now, I’ve never been much of a sports fan. In fact, at this very moment I’m considering filling this review with sports terminology that may or may not be correct just to annoy my sports-loving editor. But one thing I do know is that baseball should be played in pants, assuming you enjoy having skin on your legs. So right off the bat, that’s a major strike against Cinderella Girls, for both inaccuracy and prioritizing cuteness over function. The bloomy backgrounds and regularly off-model animation speak to a minor league production, and I wasn’t remotely surprised to discover it’s based on a mobile game. The girls are here to look cute while playing baseball, not athletic. Even when Tsubasa hits a home run or Nozomi throws a ball an impressive distance, they do it with their limbs angled awkwardly, with absolutely no sense of weight or power to them. All that said… I didn’t hate it. I wasn’t bowled over, but they didn’t drop the ball either. Much of the episode features a pick-up game played on a riverbank, and the classic cute-girl atmosphere of cheerful support works well here. In fact, it’s probably the most relatable a sports anime has ever been to me. I’ve never had much athletic talent (in elementary school I couldn’t even play kickball if the ball wasn’t literally placed in front of me), but I’ve played casual games with friends on occasion. Those games were done just for fun, and it didn’t matter if my form was terrible or if anyone was keeping score. So, when Nozomi holds the bat awkwardly and never swings, it doesn’t matter beyond igniting a minor argument about whether it should be a strike or a ball. No one gets mad at her—they just offer advice on a better way to grip the bat. Serious sports anime often feature hyper-competitive players who are willing to do anything they can for the sake of victory and the spirit of fun often gets lost in the process. But in this premiere, it’s not about the agony of victory or the joy of defeat or whatever, it’s about playing a game. Which is supposed to be fun. Look, part of me wants to get mad about how it’s only written like that because girls’ sports aren’t taken seriously and how there should be more anime that do present it as highly competitive and etc., etc. But the last show to do that was Hanebado, which I ended up dropping because it was utterly joyless. Cinderella Nine isn’t a touchdown, but I didn’t want to spike it into the dumpster either. Sometimes, it’s nice just to let sports be fun.